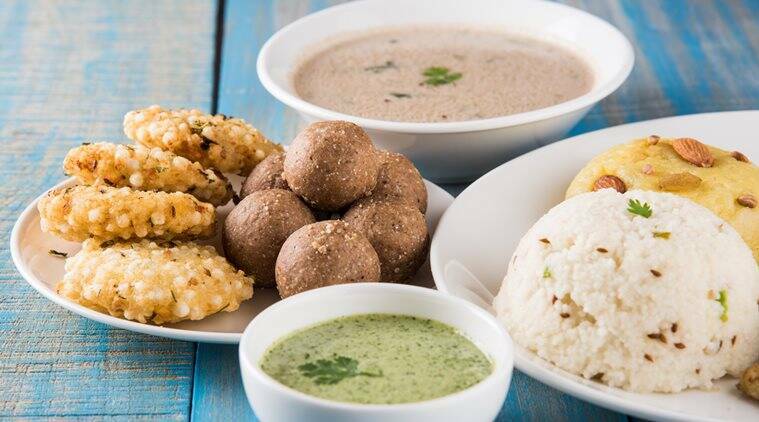 To up the ante of your detox routine, you can have the sabudana khichdi with veggies, kuttu ke ate ki kadhi, dosa made of kuttu with some curd. Samo rice can also be eaten with pudhina chutney as it detoxifies the body very well. Do you cheat on every diet you talk yourself into? If so, Navratri can be the ideal opportunity for you to lose weight and detox. Navratri fasting is believed to bring divine blessing and no way can anyone plan to cheat on that. Here are some things you can eat to lose weight during Navratri which dietician Apoorva Saini of Santoshiarogyam Diet E Clinic swears by. 1) Protein and fibre are major requirements: They greatly help in weight loss. Pomegranate has lots of fiber, which can really help you if you chew the pomegranate seeds. You can add curd to the seeds if you want. Also, if your fiber intake is more, it can lead to dehydration, so make sure you drink 2-3 litres of water to make up for it. 2) Limit the consumption of fried food: Fried and oil-soaked foods are a favourite during this time. If you want to detox, limiting the intake of fried puris, pakodas and potato chips is very important. Especially for high-cholesterol patients, fat intake should be less. If you have to eat the kuttu pakodis, you can stuff them with paneer and veggies and fry them in olive oil. 3) Infused water will help you detox: You can have mint water, cucumber water or fruit-infused water instead of your plain water. To make infused water, soak 100g of fruit in 300ml water overnight. Shakes also help a great deal in detoxifying. But Saini advises going with curd-based shakes, instead of milk-based. “Mix some strawberries with curd and blend them in the mixer. You can add sugar if needed,” she says. This shake can be taken mid-morning. 4) Mix vegetables with Sabudana khichdi: Most people prefer to eat Sabudana khichdi (Buckwheat khichdi) and kuttu at this time. To up the ante of your detox routine, you can have Sabudana khichdi with veggies, kuttu ke ate ki kadhi, dosa made of kuttu with some curd. Samo rice can also be eaten with pudina (mint) chutney as it helps detoxify the body. 5) Dry fruits are most beneficial at this time: Almonds, walnuts, dates, anjeer (figs) give a lot of energy. Three figs in the morning will keep you charged through the day; 4-5 dates with 1-2 almonds a day are enough to make up for your iron deficiency that you may get while fasting. Cashews should be avoided if you have high cholesterol. Kishmish (raisin) intake should be accompanied by lots of water as kishmish promotes urination, which could cause dehydration. 6) Green leafy vegetables makeup for all nutrient deficiencies: Green leafy vegetables in the form of soups can also be taken. Beetroot soup makes up for iron and calcium deficiency due to fasting and is a great detox. Salads such as cucumber, beetroot, carrot, radish, cabbage, asparagus with lemon and mustard seeds are great for weight loss. 7) Jasmine tea is great for detoxification: Jasmine tea helps to prevent water retention and treats any water retention you might have. Thus, it should be preferred over green or black tea during this time — Try to drink milk before sleeping as it is a great source of protein.